- On medium high heat melt the butter, add the cumin powder, stir and add the uncooked rice. Stir for about a minute until the rice is coated, and add the tomato sauce and water. Bring it to a boil, season with salt and pepper, then put the heat to as low as it can go, cover it and let it simmer for 20min. Fluff with a fork, set aside and keep it covered to stay warm. - In a skillet dry fry the sausage on a high heat. When crispy set aside. - In a food processor place the bell peppers, the chili pepper and blend until it becomes saucy. Season with salt and pepper to taste. 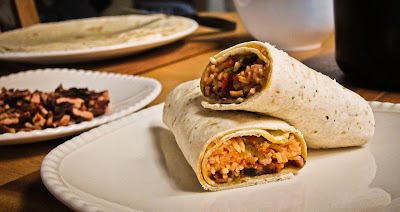 - Warm up the tortillas in the microwave or in a skillet on the stove. Spoon some of the crispy sausage, rice and pepper sauce in the middle. Fold the sides and then roll it to get a burrito. Enjoy!